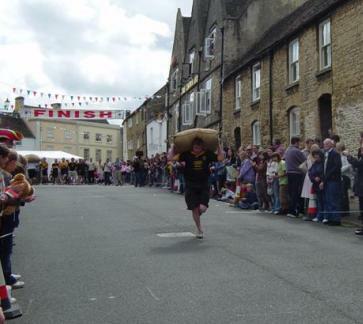 The Tetbury Woolsack Races are held on Spring Bank Holiday Monday. The Badminton Horse Trials are held in May. Polo is played regularly throughout the summer at Westonbirt and Cirencester. The Royal International Air Tattoo is held at RAF Fairford in July. The Gatcombe Park Festival of British Eventing takes place in early August. The Festival of the Tree at the National Arboretum is held at the end of August. Tetbury Music Festival takes place in early October. Enchanted Christmas at the National Arboretum is held during December. The National Arboretum at Westonbirt is the venue for a wide range of major events throughout the year. Several major Craft and Antique Fairs are held locally.